The story I remember most was called "Bread Pudding" or something like that. It was this kid who said "In our family when something upsets us or we have a bad day, we make bread pudding. "Well this kid gets home from school, turns on the TV, on which is a special report about people protesting outside an abortion clinic. And the kid sees his mom and dad going into the clinic. So the kids goes into the kitchen and makes pudding. Name: Sarah FretzCitation: Fraustino, L. R. (1998). 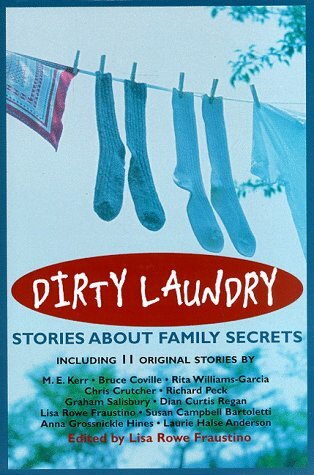 Dirty laundry: stories about family secrets. New York: Viking.Genre: Short StoriesAward: Format: HardcoverSelection: Scholastic Teachers and Publisher's WeeklyDirty Laundry by Lisa Rowe Fraustino | Scholastic.com. (n.d.). Scholastic, Helping Children Around the World to Read and Learn | Scholastic.com. Retrieved April 8, 2013, from http://www.scholastic.com/teachers/bo...Forecasts: Children's books. (1998). Publishers Weekly, 245(23), 61.Review: Although the book is approximately fifteen years old, Dirty Laundry: stories about family secrets tells eleven stories that most teens and even adults can connect to. Each story is written by a popular author that most teens know. What is unique about each of these stories is how they each tell a story about a family with a secret. These stories touch upon many subjects including death, pregnancy, mental illness, divorce, and even stage fright. Each story reveals a secret that the family is holding, sometimes even for generations. As the secrets get revealed, the reader comes to empathize or understand where the characters are coming from.One of the best stories in the book was written by popular young adult author Laurie Halse Anderson. In her story Passport, young Jared is dealing with the divorce of his parents and his father's new girlfriend. Uniquely enough, Jared tells his story mostly in terms of a war zone with statements such as "Land of Mom", "Kingdom of Dad" and his need to "maintain diplomatic relations with both parents until graduation." Her funny yet serious story is one that many teens can relate to as they grapple with being torn between parents while trying to balance a teenage life.Although not all stories are as engaging as Passport, they all have a story or message to tell. A reader can easily find a story that they could relate to. Each family has a secret (or more than one!) and these stories show that there are not only other people (even if fictional) with these secrets but also cause the readers to think of how bad secrets can be for others. Recommended. personal response: I likes this story lot, it tells a great story in just a couple of pages. I can't really connect to it since I've never been to a mental hospital or had a family member live in a mental hospital. I rated it 5 stars because even though I couldn't really connect I still really enjoyed the book.plot summary: It all starts when Susie goes to school and there's a nurse in her class. The nurse is from a mental hospital and brought two patients to speak. one of them is deaf and the other is just crazy. The crazy one is named Mammie Ellis and is another main character in the story. Mammie Ellis only says three sentences. "I'm Mammie Ellis, I'm going to hell, I'll die when I'm ninety." for some reason Susie goes to volunteer and help Mammie Ellis. Mammie Ellis still only says those three sentences but as the story goes on and they bond more she says more sentences. Then at the end of the school year Susie goes to college and when she comes back the nurse stops her and tells her that Mammie Ellis was very sad when she wasn't showing up daily and now forgot about her. Susie stops going to see Mammie Ellis.Recommendations: I recommend this book to high schoolers who have time to read a short story or maybe need to for a good reads. I think that many kids could connect but even if you can't connect it's still a good story. Fraustino did a good job of picking the short stories that revolved around the theme of secrets, and most of the time they were very surprising though I found some of them to be quite predictable. This book managed to lure me in with the intro in which the editor shared a secret about herself which gave the book more of a personal feel to it. Actually, I felt as if this whole book was relatable to some extent since everybody has had secrets that they have wanted to keep hidden but were exposed. My favorite short stories of this book would have to be The Secret of Life, According to Aunt Gladys and FRESh PAINt. I liked The Secret of Life, According to Aunt Gladys because it really just questions on how most people pretend to be normal when nobody really is and how there was a huge plot twist in the end. When I reread the story I noticed that there was some foreshadowing to it but it was really subtle. I enjoyed the story of FRESh PAINt because it gave some insight on mental illnesses and it had a plot twist at the end as well with foreshadowing that was less subtle. Overall, these stories carried a heavy impact in a few pages and this will certainly be a book that I will reread. This is an interesting collection of 11 short stories that all have to do with family secrets written for teens/young adults.The theme is an interesting one. I liked the ones that focused on the obvious secrets a family can have - family members that are never talked about, personal histories that are really painful, etc., but I was really surprised by a couple of them which ended up being ghost stories - talk about skeletons in the attic! I enjoyed several of these stories, and had read other works by two of the authors.Overall I enjoyed the book. I liked getting a quick glimps at what could be a larger story. I would recommend this to young adults looking for new authors to try, as well as anyone who likes short stories. YA - stumbled upon this short story collection and the title grabbed me. Different fictional stories that highlights the fact we all have secrets we are hiding. Three and a half. Not four, but good.